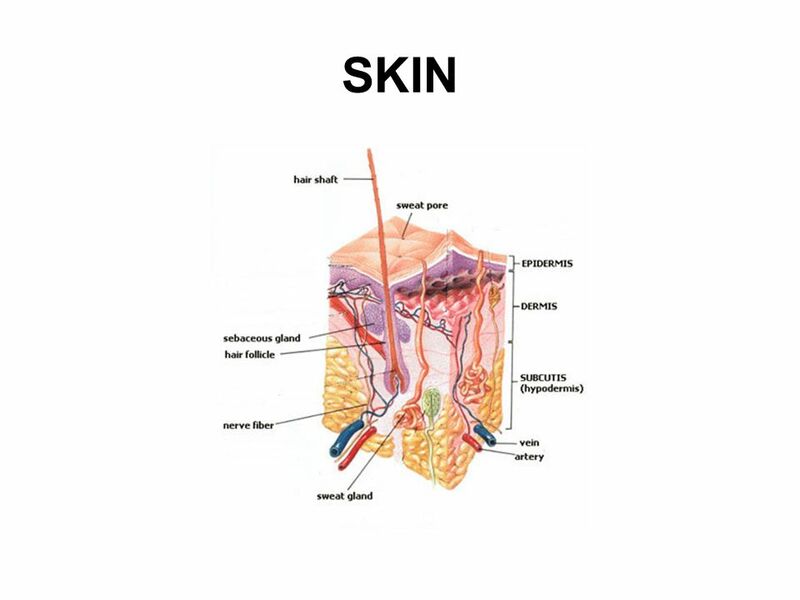 2 SKIN Skin - The skin is the outer covering of the body, also known as the epidermis. 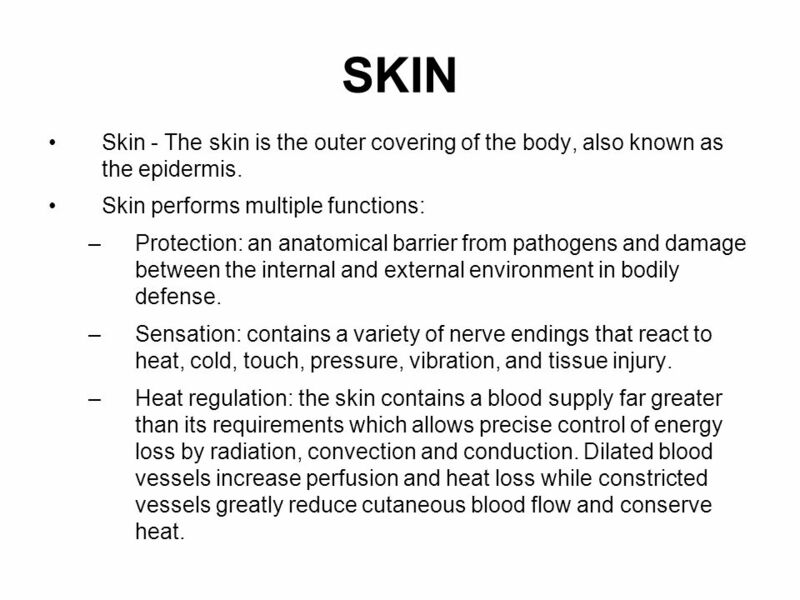 Skin performs multiple functions: Protection: an anatomical barrier from pathogens and damage between the internal and external environment in bodily defense. Sensation: contains a variety of nerve endings that react to heat, cold, touch, pressure, vibration, and tissue injury. Heat regulation: the skin contains a blood supply far greater than its requirements which allows precise control of energy loss by radiation, convection and conduction. Dilated blood vessels increase perfusion and heat loss while constricted vessels greatly reduce cutaneous blood flow and conserve heat. 3 SKIN Control of evaporation: the skin provides a relatively dry and impermeable barrier to fluid loss. Loss of this function contributes to the massive fluid loss in burns. Storage and synthesis: acts as a storage center for lipids and water, as well as a means of synthesis of vitamin D. Excretion: sweat contains urea, however its concentration is 1/130th that of urine, hence excretion by sweating is at most a secondary function to temperature regulation. Absorption: While skin acts as a barrier some chemicals are readily absorbed through it. Water resistance: The skin acts as a water resistant barrier so essential nutrients aren't washed out of the body. 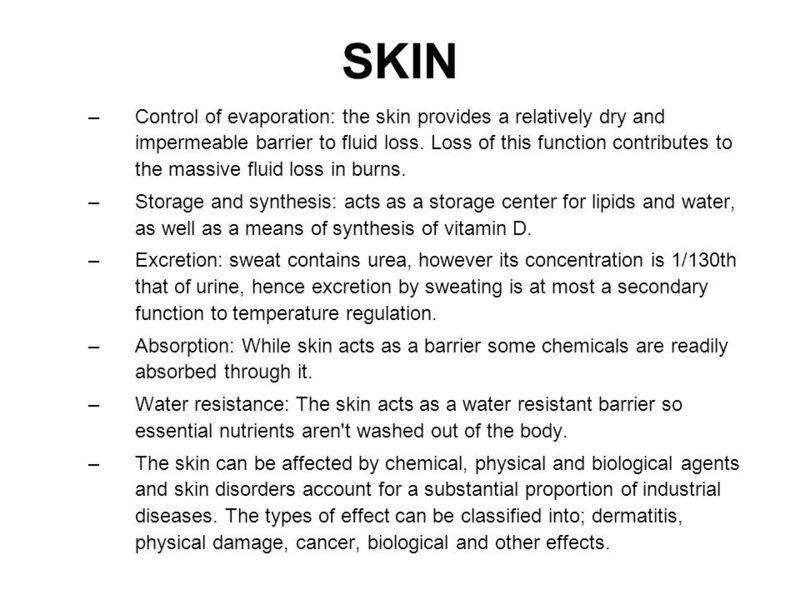 The skin can be affected by chemical, physical and biological agents and skin disorders account for a substantial proportion of industrial diseases. 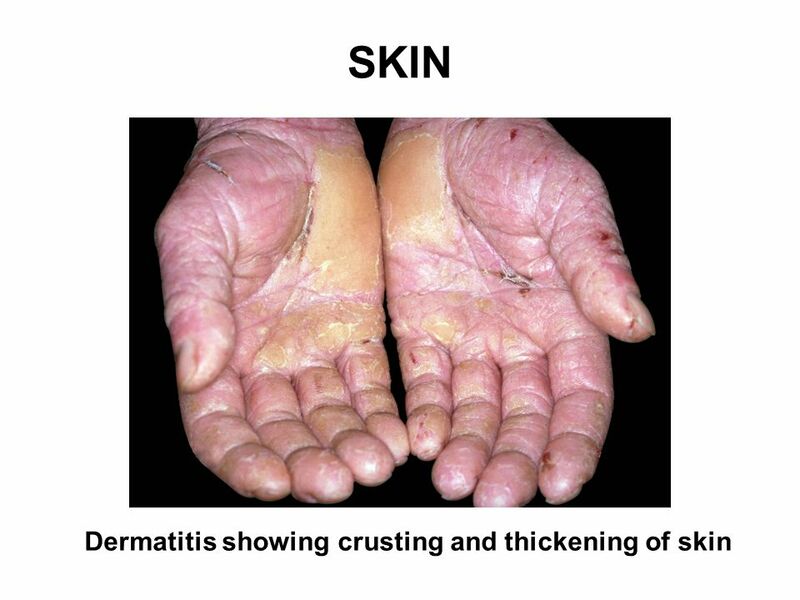 The types of effect can be classified into; dermatitis, physical damage, cancer, biological and other effects. 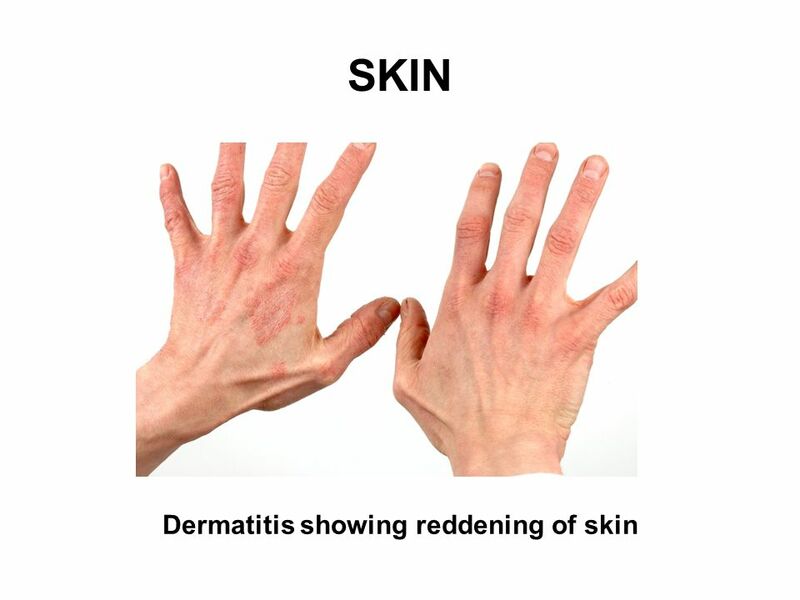 5 SKIN Dermatitis The most common disorder is contact dermatitis and 70% of cases are due to primary irritation i.e. direct action on the skin. 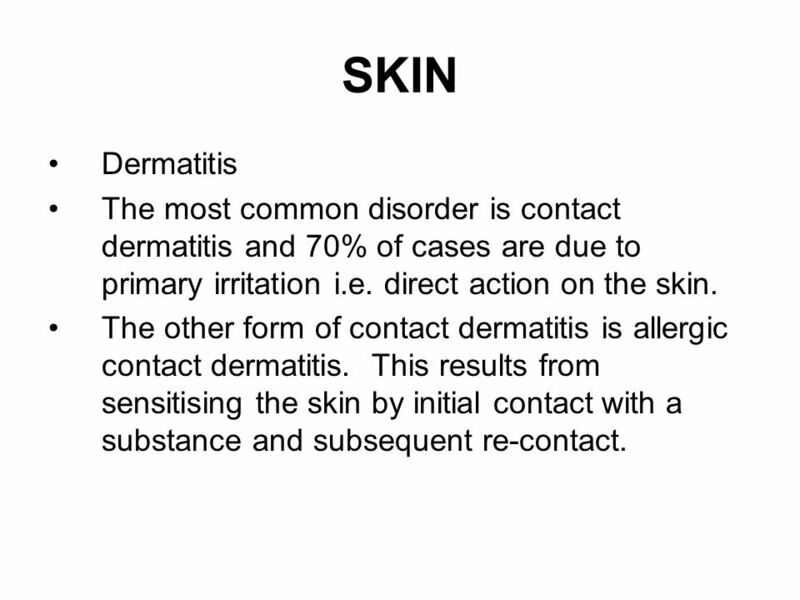 The other form of contact dermatitis is allergic contact dermatitis. This results from sensitising the skin by initial contact with a substance and subsequent re-contact. 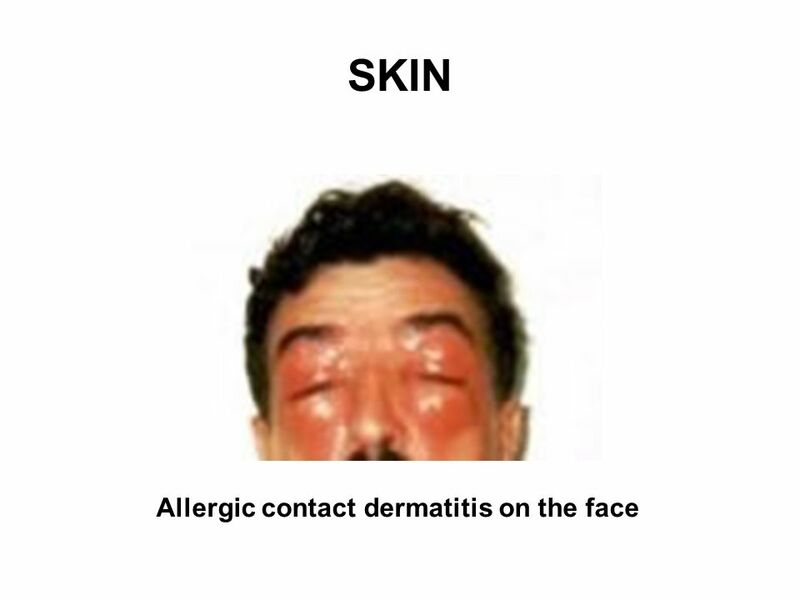 9 SKIN Physical agents which can harm the skin include weather, friction and injury. 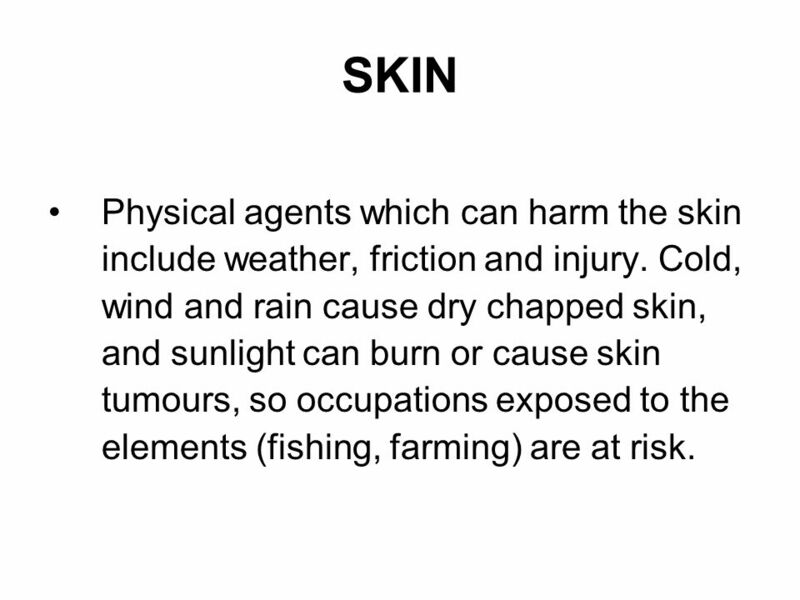 Cold, wind and rain cause dry chapped skin, and sunlight can burn or cause skin tumours, so occupations exposed to the elements (fishing, farming) are at risk. three days after a significant exposure to sun without sunscreen. 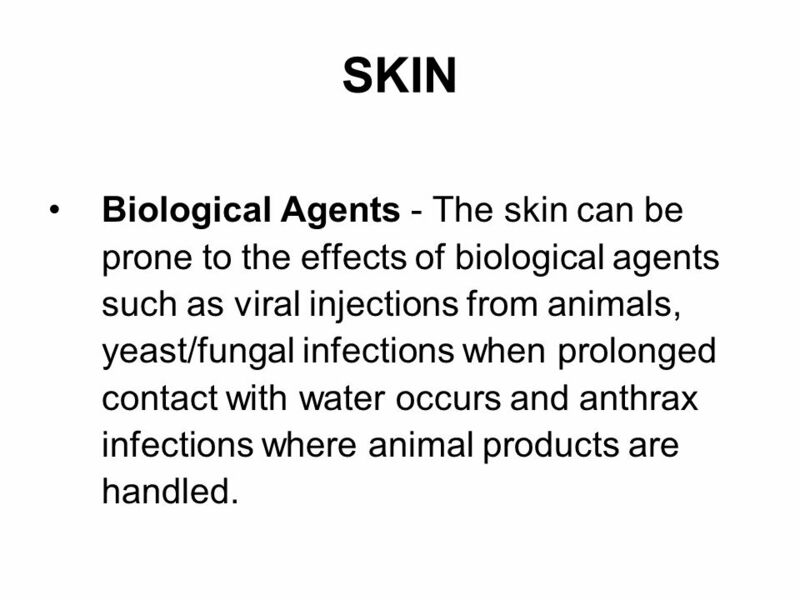 11 SKIN Biological Agents - The skin can be prone to the effects of biological agents such as viral injections from animals, yeast/fungal infections when prolonged contact with water occurs and anthrax infections where animal products are handled. 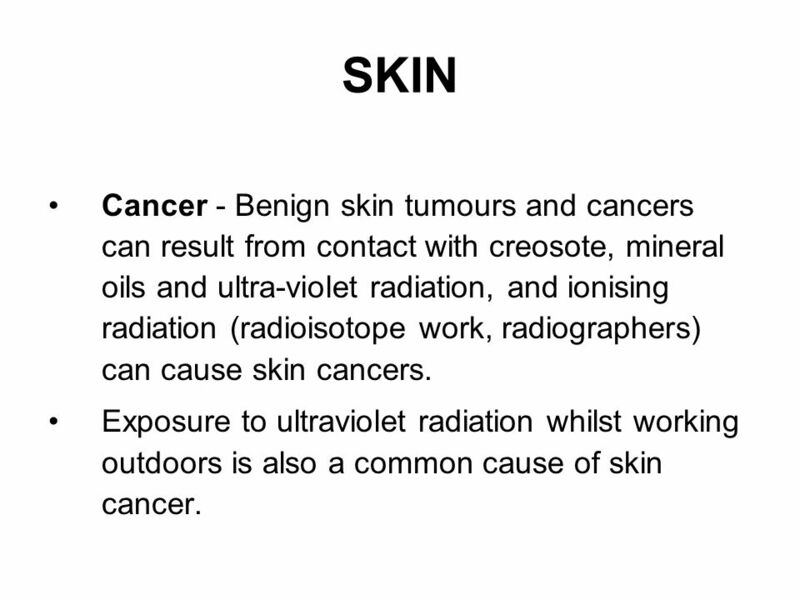 12 SKIN Cancer - Benign skin tumours and cancers can result from contact with creosote, mineral oils and ultra-violet radiation, and ionising radiation (radioisotope work, radiographers) can cause skin cancers. 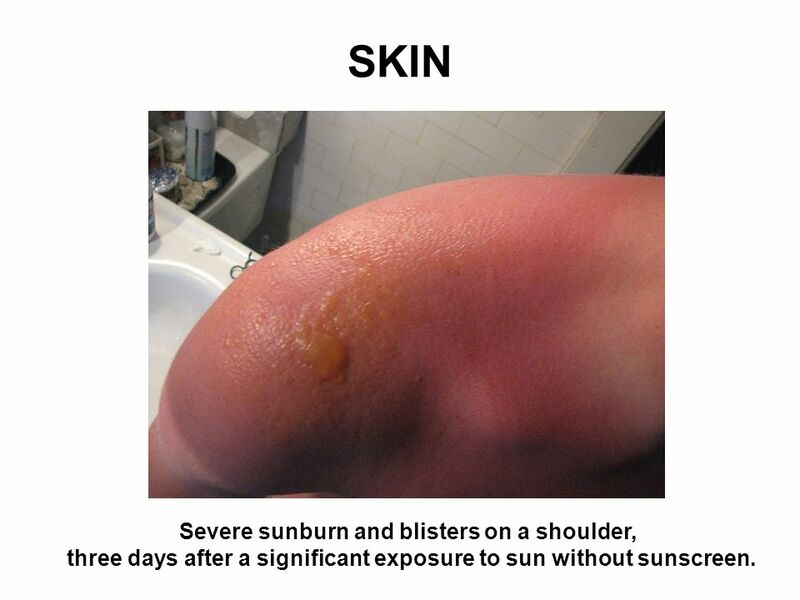 Exposure to ultraviolet radiation whilst working outdoors is also a common cause of skin cancer. 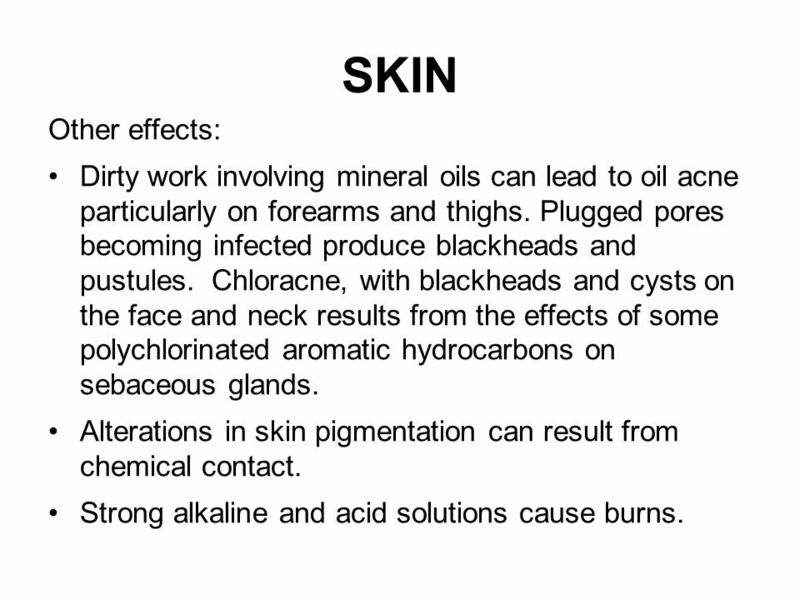 14 SKIN Other effects: Dirty work involving mineral oils can lead to oil acne particularly on forearms and thighs. Plugged pores becoming infected produce blackheads and pustules. Chloracne, with blackheads and cysts on the face and neck results from the effects of some polychlorinated aromatic hydrocarbons on sebaceous glands. 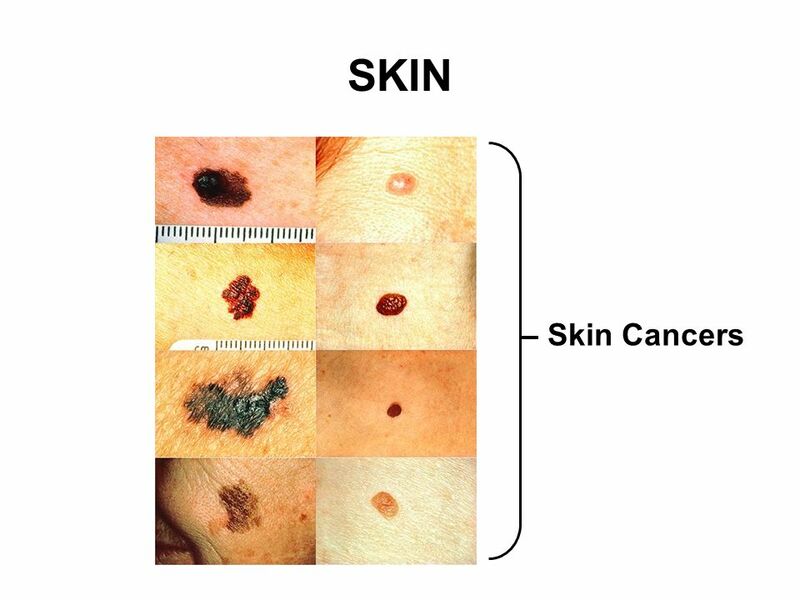 Alterations in skin pigmentation can result from chemical contact. Strong alkaline and acid solutions cause burns. 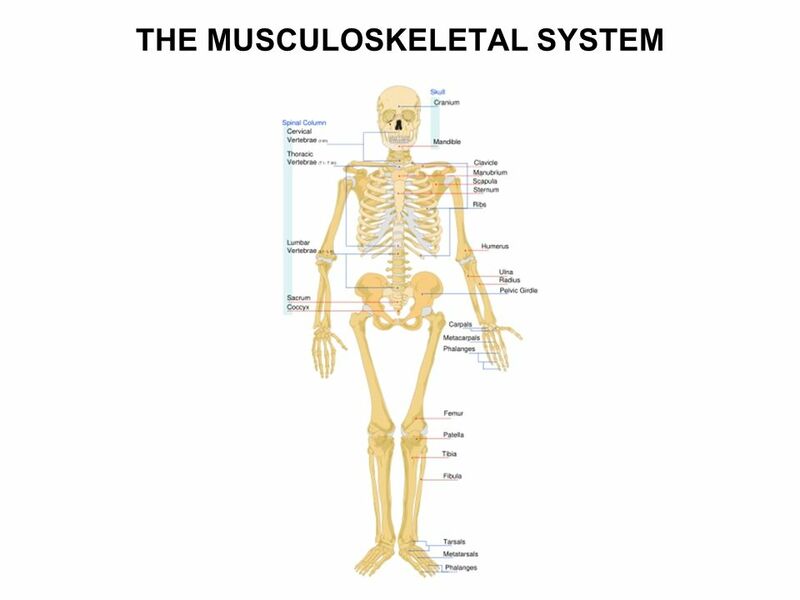 The musculoskeletal system provides form, stability, and movement to the human body. It is made up of the body's bones the skeleton, muscles, cartlidge, tendons, ligamanets, and joints. The musculoskeletal system's primary functions include supporting the body, allowing motion, and protecting vital organs. 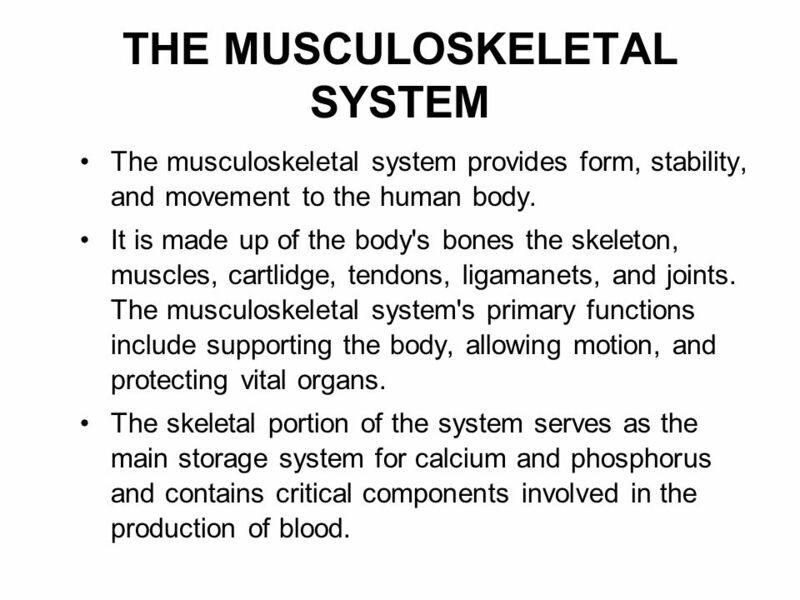 The skeletal portion of the system serves as the main storage system for calcium and phosphorus and contains critical components involved in the production of blood. 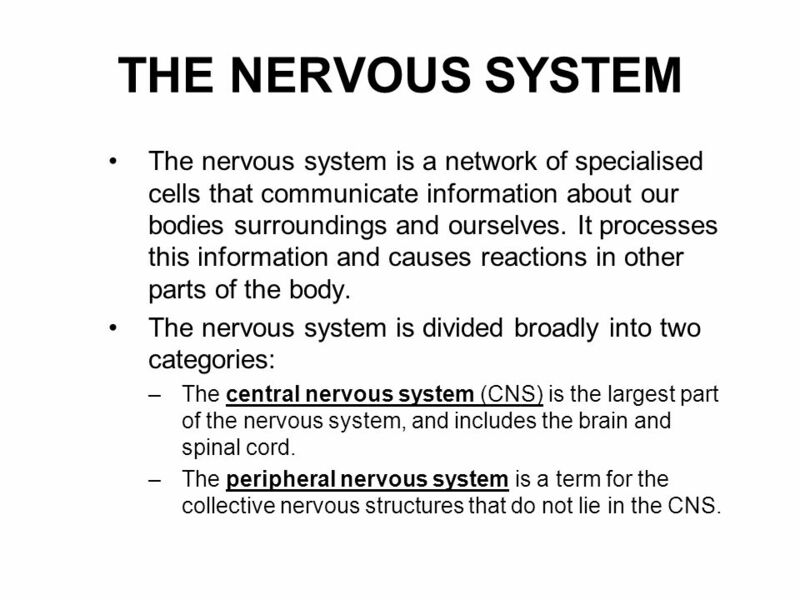 17 THE NERVOUS SYSTEM The nervous system is a network of specialised cells that communicate information about our bodies surroundings and ourselves. It processes this information and causes reactions in other parts of the body. 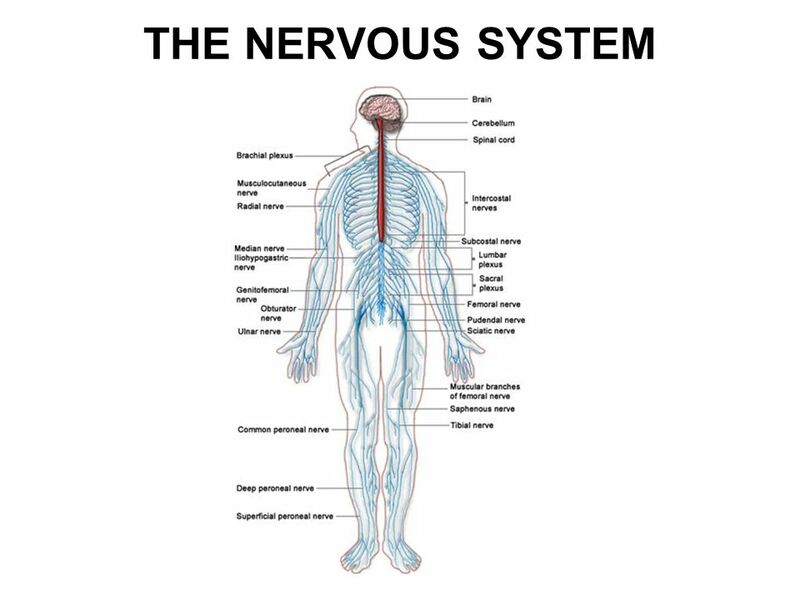 The nervous system is divided broadly into two categories: The central nervous system (CNS) is the largest part of the nervous system, and includes the brain and spinal cord. The peripheral nervous system is a term for the collective nervous structures that do not lie in the CNS. 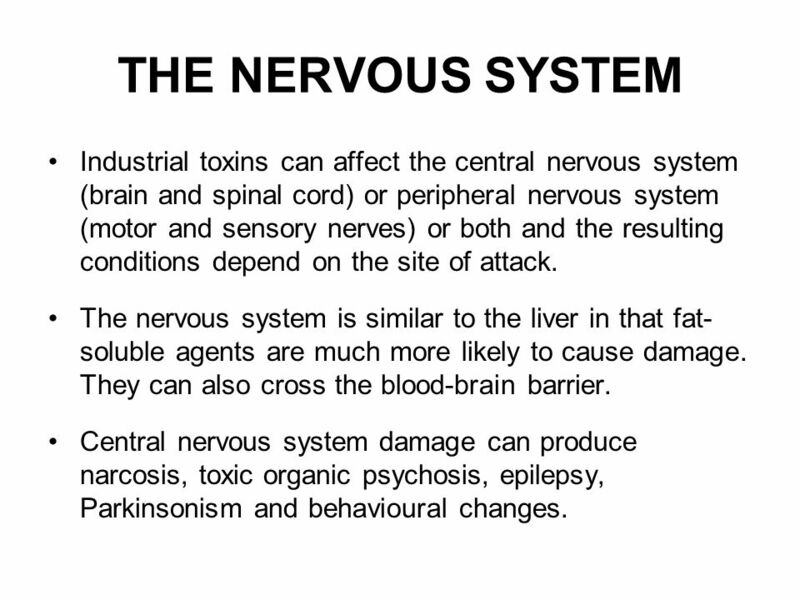 19 THE NERVOUS SYSTEM Industrial toxins can affect the central nervous system (brain and spinal cord) or peripheral nervous system (motor and sensory nerves) or both and the resulting conditions depend on the site of attack. The nervous system is similar to the liver in that fat- soluble agents are much more likely to cause damage. They can also cross the blood-brain barrier. Central nervous system damage can produce narcosis, toxic organic psychosis, epilepsy, Parkinsonism and behavioural changes. 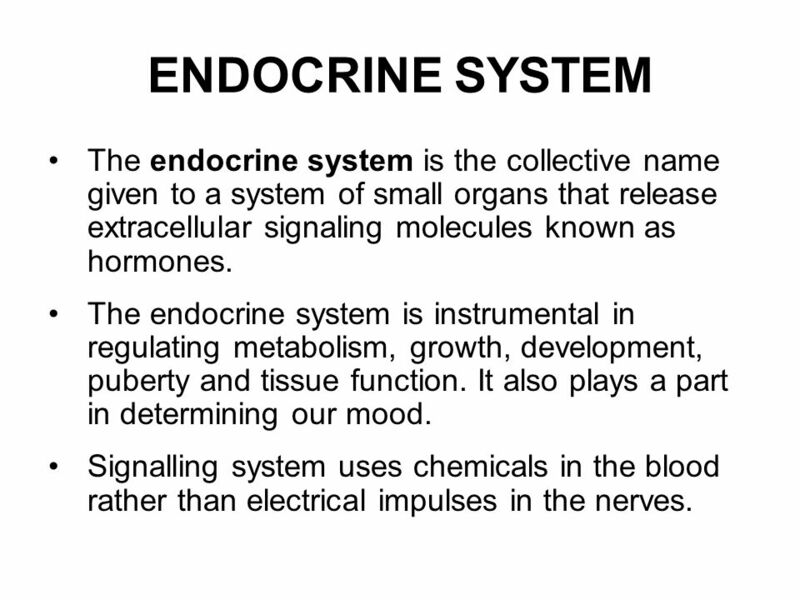 20 ENDOCRINE SYSTEM The endocrine system is the collective name given to a system of small organs that release extracellular signaling molecules known as hormones. 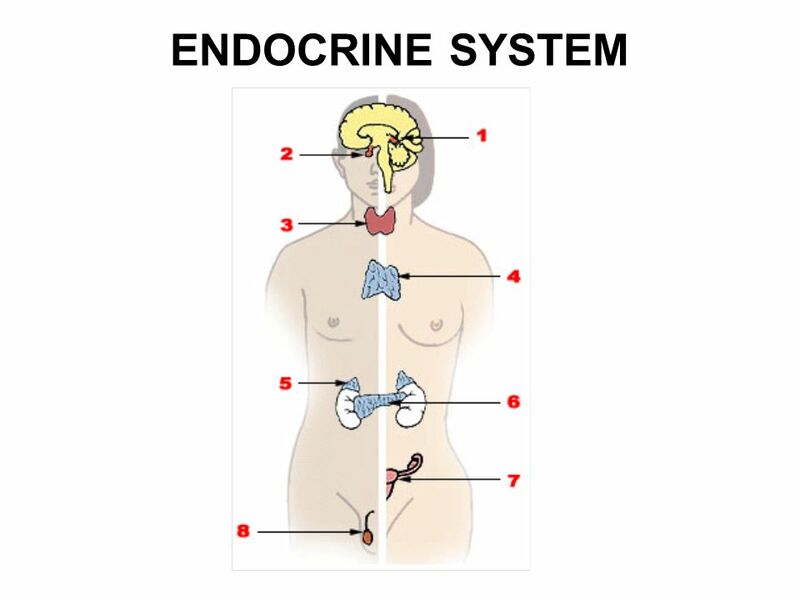 The endocrine system is instrumental in regulating metabolism, growth, development, puberty and tissue function. It also plays a part in determining our mood. 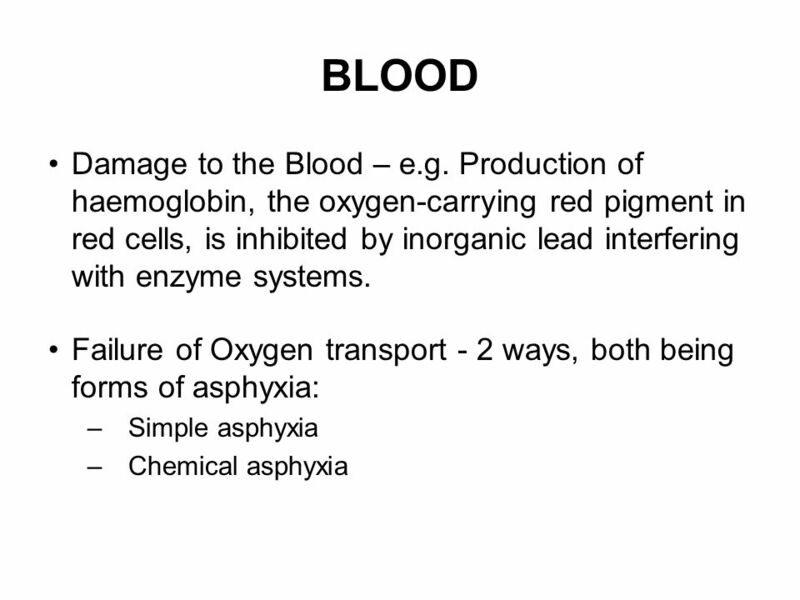 Signalling system uses chemicals in the blood rather than electrical impulses in the nerves. 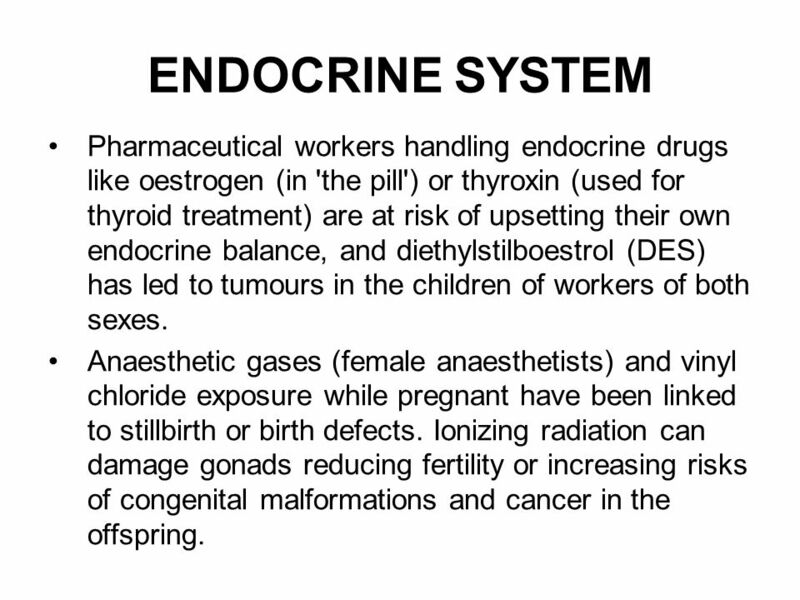 22 ENDOCRINE SYSTEM Pharmaceutical workers handling endocrine drugs like oestrogen (in 'the pill') or thyroxin (used for thyroid treatment) are at risk of upsetting their own endocrine balance, and diethylstilboestrol (DES) has led to tumours in the children of workers of both sexes. Anaesthetic gases (female anaesthetists) and vinyl chloride exposure while pregnant have been linked to stillbirth or birth defects. Ionizing radiation can damage gonads reducing fertility or increasing risks of congenital malformations and cancer in the offspring. 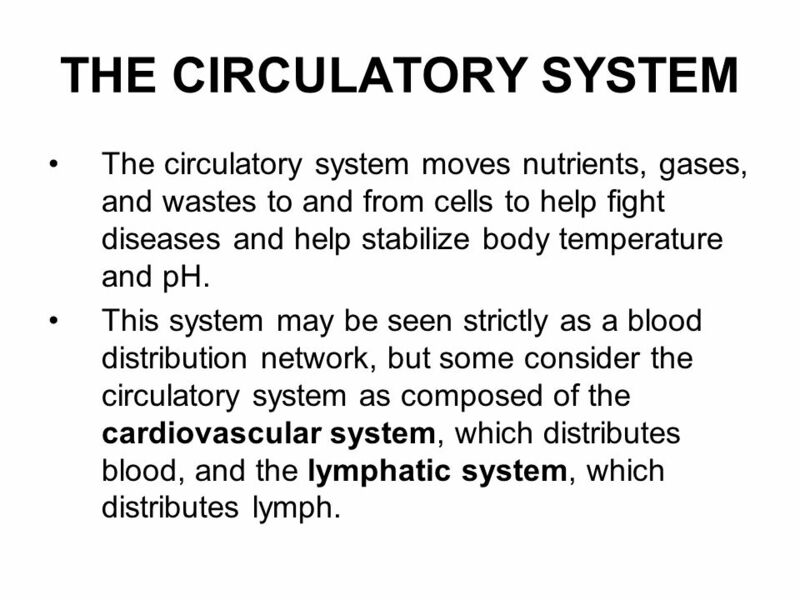 The circulatory system moves nutrients, gases, and wastes to and from cells to help fight diseases and help stabilize body temperature and pH. This system may be seen strictly as a blood distribution network, but some consider the circulatory system as composed of the cardiovascular system, which distributes blood, and the lymphatic system, which distributes lymph. The main components of the human circulatory system are the heart, the blood and the blood vessels. 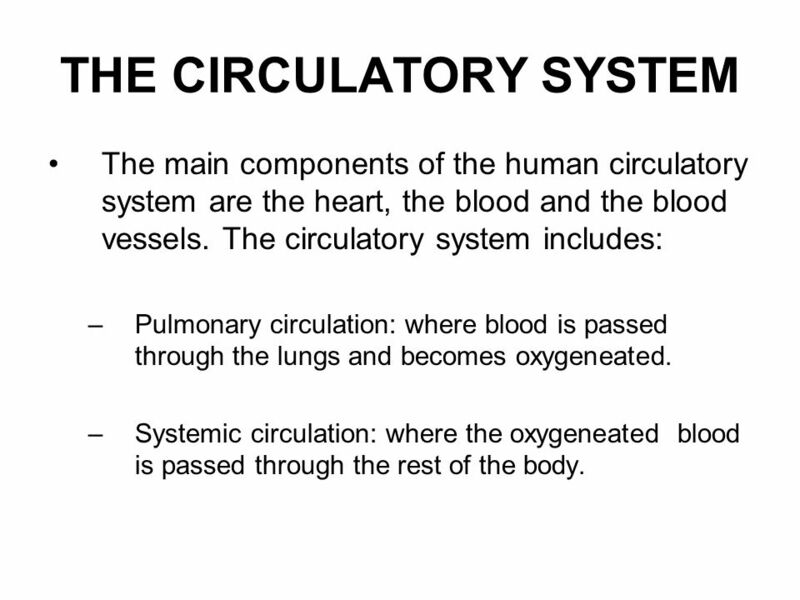 The circulatory system includes: Pulmonary circulation: where blood is passed through the lungs and becomes oxygeneated. 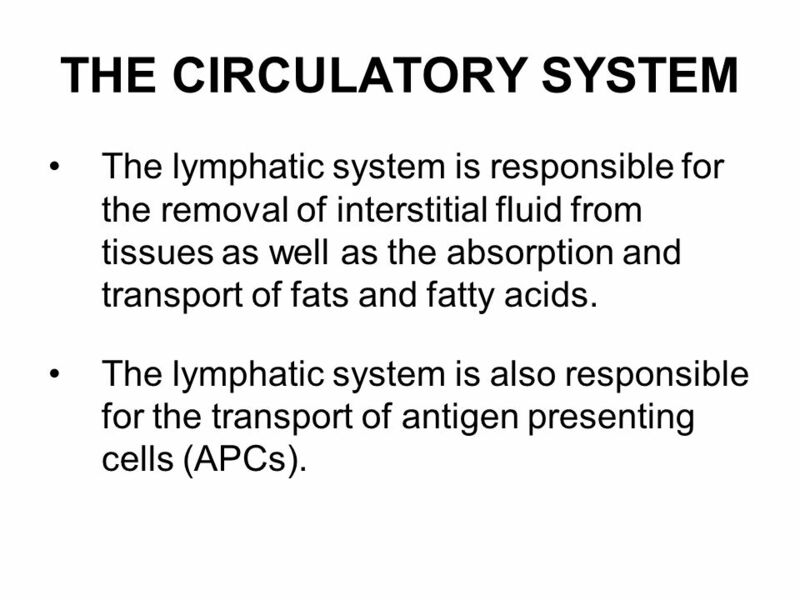 Systemic circulation: where the oxygeneated blood is passed through the rest of the body. The lymphatic system is responsible for the removal of interstitial fluid from tissues as well as the absorption and transport of fats and fatty acids. The lymphatic system is also responsible for the transport of antigen presenting cells (APCs). 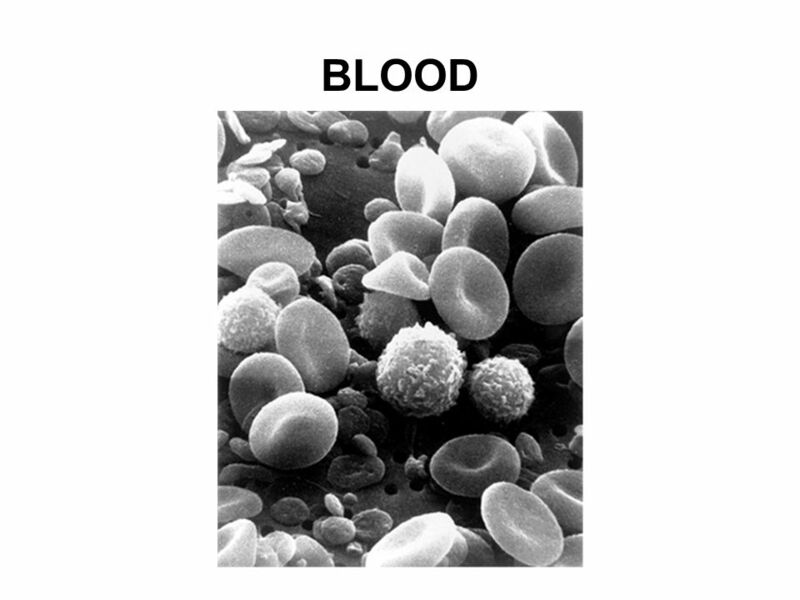 The cardiovascular system is exposed to any agent carried in the blood. 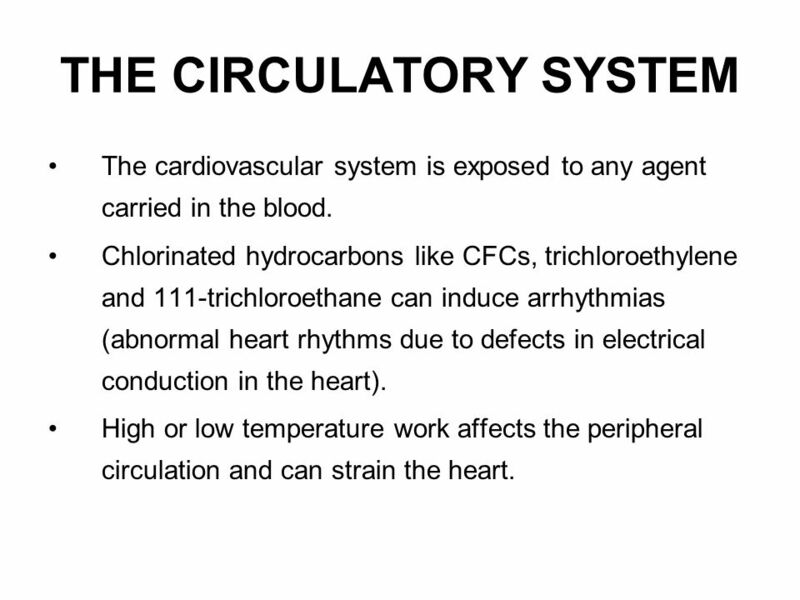 Chlorinated hydrocarbons like CFCs, trichloroethylene and 111-trichloroethane can induce arrhythmias (abnormal heart rhythms due to defects in electrical conduction in the heart). High or low temperature work affects the peripheral circulation and can strain the heart. 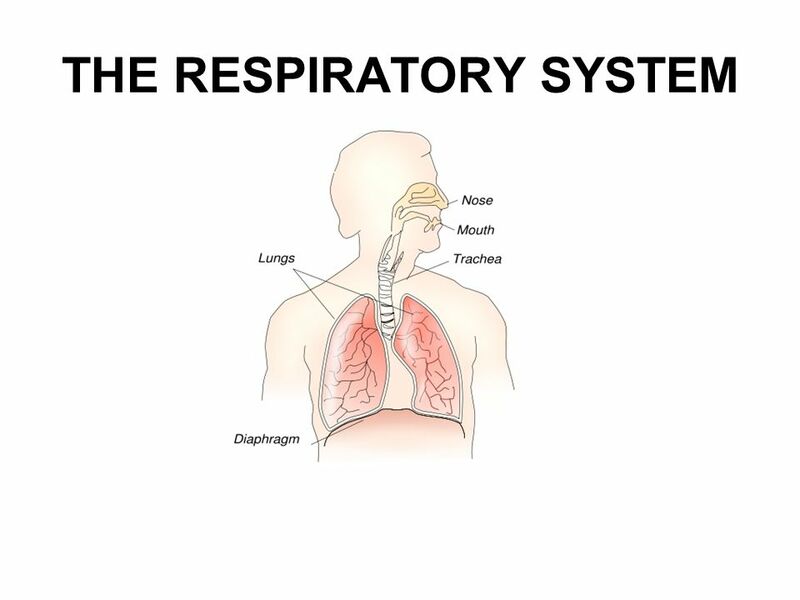 The major function of the respiratory system is gas exchanged between the external environment and the circulatory system. Like the skin and the eye, the lungs are affected by irritants and allergens. They also respond in the forms of fibrotic pneumoconiosis and malignant disease to a variety of industrial agents. Particles greater than 10 μm in diameter are filtered by the nose. Irritation caused by gases and fumes produce inflammation of the respiratory tract and the symptoms tend to be acute or delayed, depending on the solubility of the toxic agent. Allergic reactions to substances can cause occupational asthma. 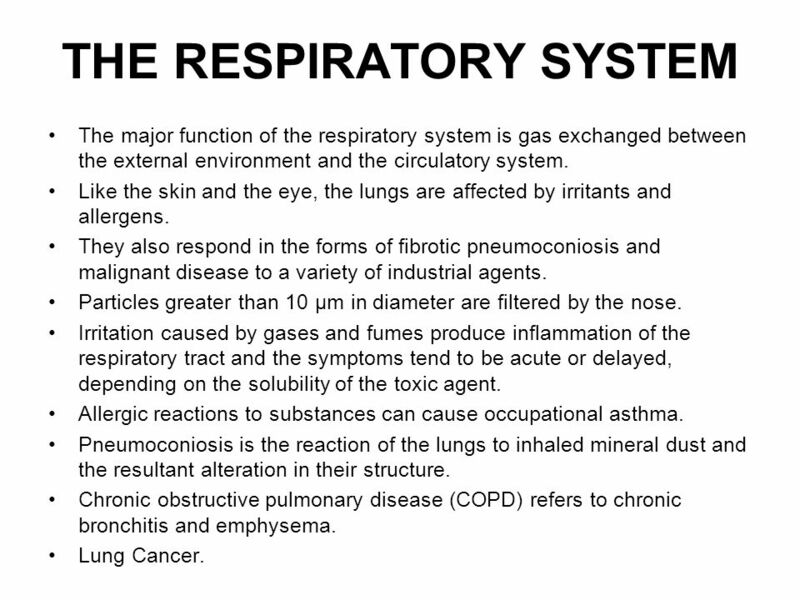 Pneumoconiosis is the reaction of the lungs to inhaled mineral dust and the resultant alteration in their structure. Chronic obstructive pulmonary disease (COPD) refers to chronic bronchitis and emphysema. Lung Cancer. 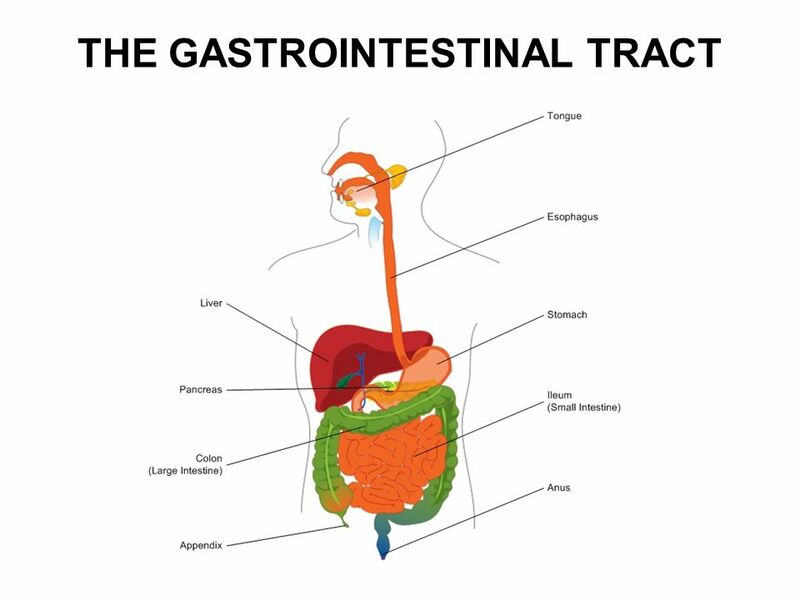 The gastrointestinal tract is the system used by the body to take in, break down and absorb nutrients as well as to excrete waste products. 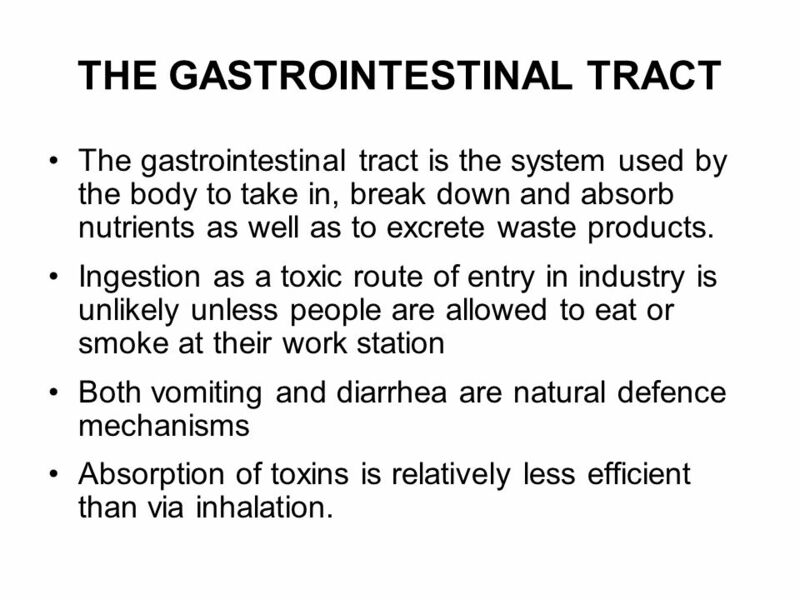 Ingestion as a toxic route of entry in industry is unlikely unless people are allowed to eat or smoke at their work station Both vomiting and diarrhea are natural defence mechanisms Absorption of toxins is relatively less efficient than via inhalation. 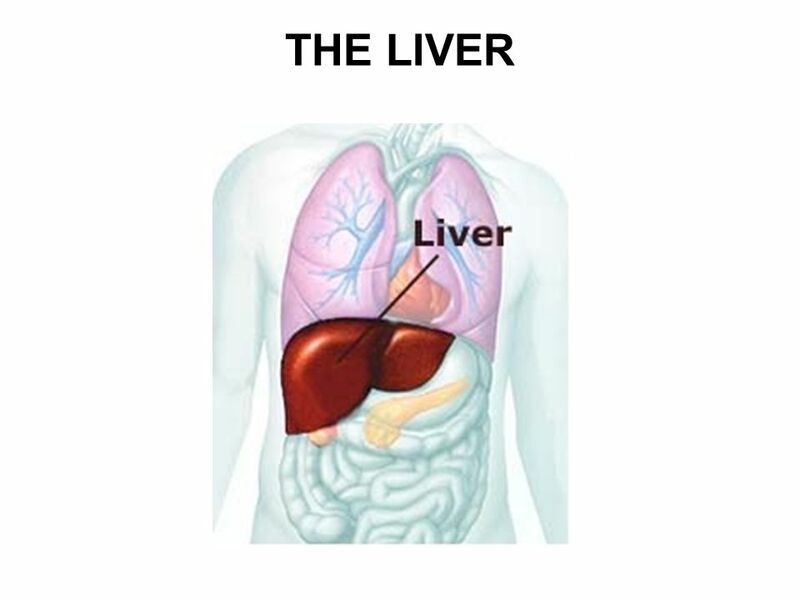 34 THE LIVER The liver is a major metabolic organ which is used to process nutrients which have been absorbed into the blood from the gastrointestinal tract or via other routes such as inhalation. The fact that it is used to break down materials means that is particularly susceptible to any toxins within the body. Liver cells can regenerate after toxic damage, the most common cause of which is alcohol. However, continued absorption can overtake the regeneration process and cause permanent liver damage. Pre-existing liver disease makes this more likely. 35 THE LIVER Industrially, fat-soluble alcohols and halogenated hydrocarbons are particularly known for their liver cell damage. The most obvious sign of liver damage is jaundice. 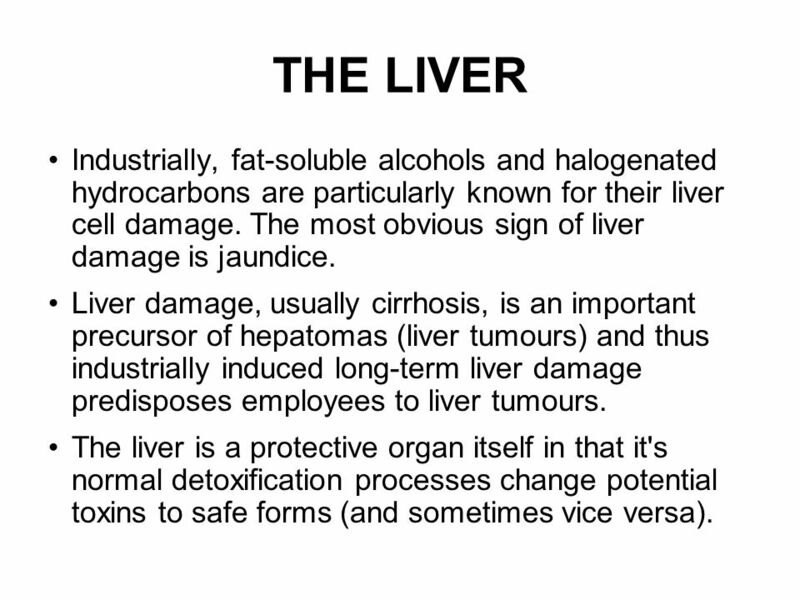 Liver damage, usually cirrhosis, is an important precursor of hepatomas (liver tumours) and thus industrially induced long-term liver damage predisposes employees to liver tumours. 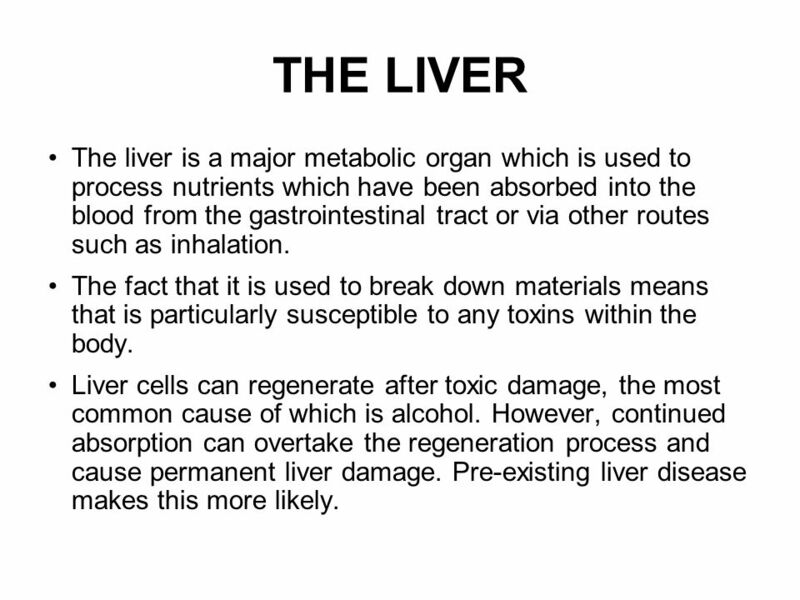 The liver is a protective organ itself in that it's normal detoxification processes change potential toxins to safe forms (and sometimes vice versa). 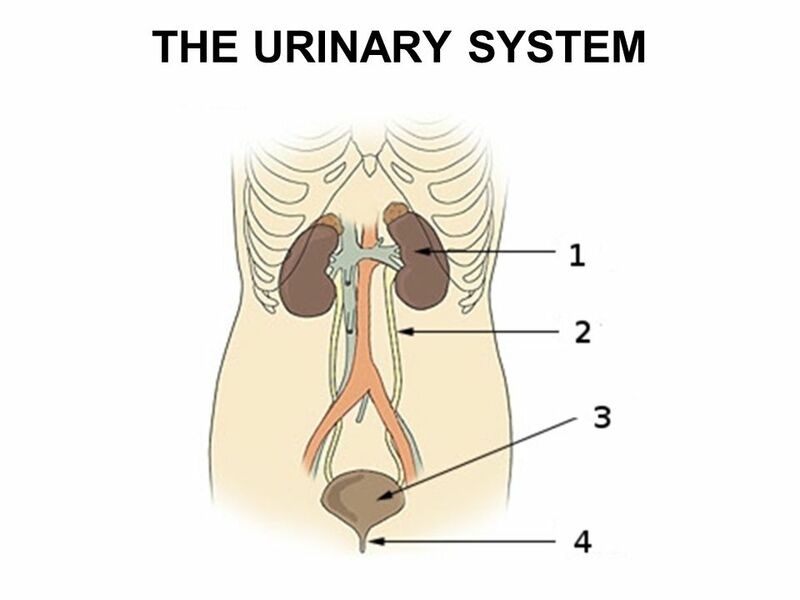 37 THE URINARY SYSTEM The kidney plays an important role in the maintenance of fluid and electrolyte balance by filtration and selective re-absorption of them into the blood. 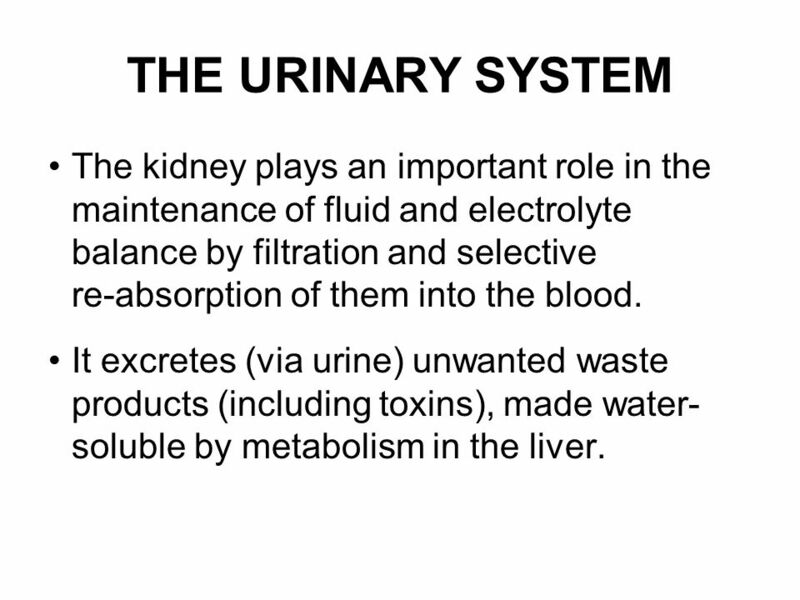 It excretes (via urine) unwanted waste products (including toxins), made water- soluble by metabolism in the liver. 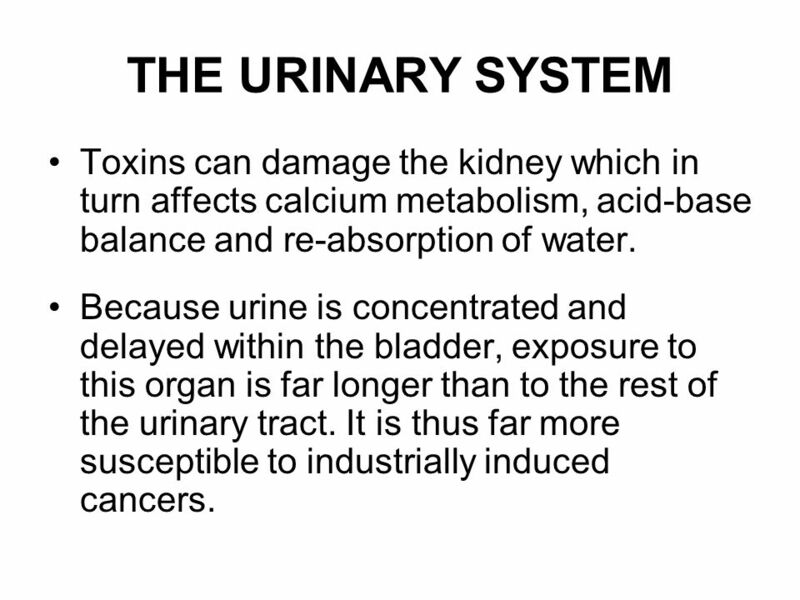 38 THE URINARY SYSTEM Toxins can damage the kidney which in turn affects calcium metabolism, acid-base balance and re-absorption of water. Because urine is concentrated and delayed within the bladder, exposure to this organ is far longer than to the rest of the urinary tract. It is thus far more susceptible to industrially induced cancers. 39 THE EYE No explanation as to there functions needed. Fragile, particularly susceptible to injury. 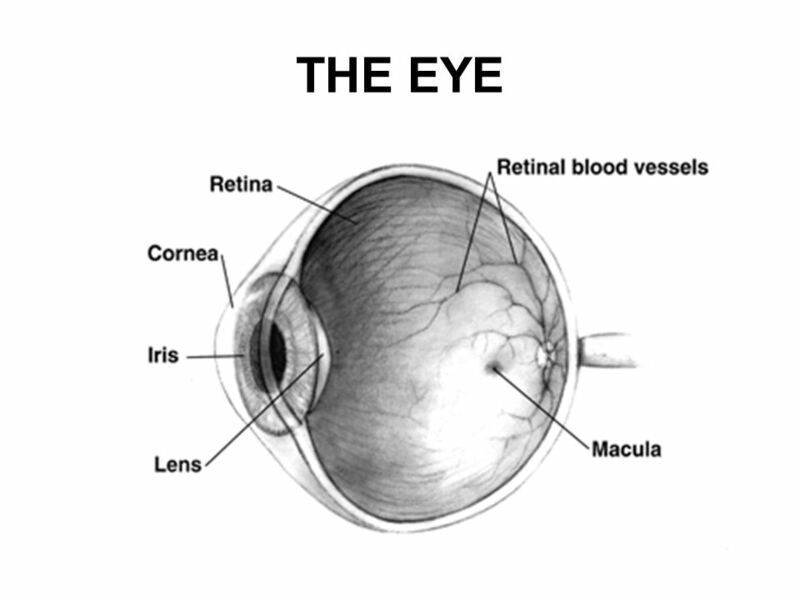 Penetrating wounds can lead to corneal damage Acids and alkalis will burn the cornea. Any irritant gases, like sulphur dioxide and ammonia can cause conjunctivitis (characterised by redness, discomfort and watering of the eyes). Allergens like plants and dyes sometimes produce a similar reaction. 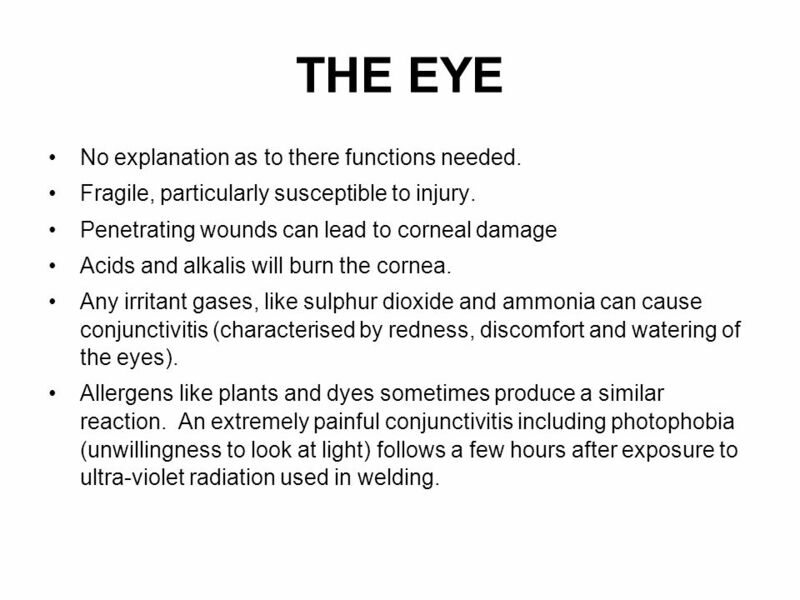 An extremely painful conjunctivitis including photophobia (unwillingness to look at light) follows a few hours after exposure to ultra-violet radiation used in welding. 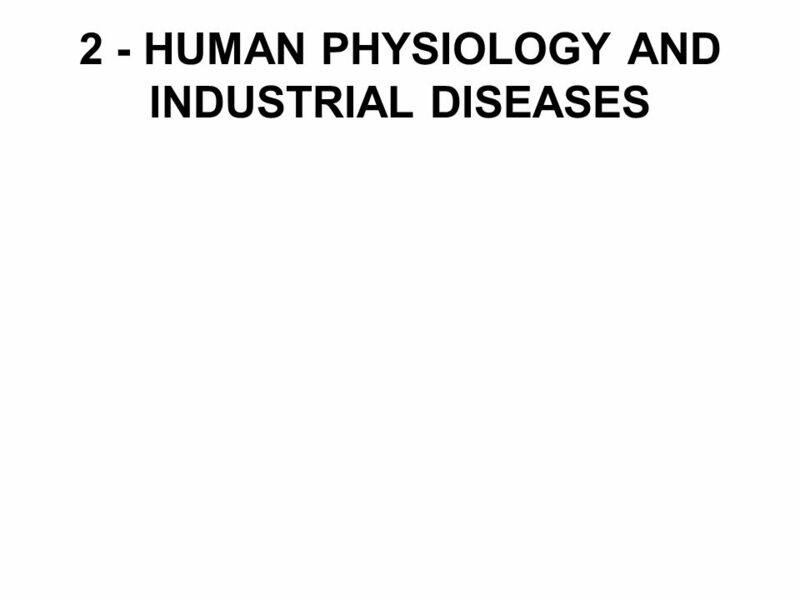 Download ppt "2 - HUMAN PHYSIOLOGY AND INDUSTRIAL DISEASES"
Body Parts An Organ System Overview. Suzanne D'Anna1 Body Systems. Suzanne D'Anna2 Body Systems n integumentary n skeletal n muscular n nervous n endocrine n cardiovascular n lymphatic and. HUMAN SYSTEMS. INTEGUMENTARY skin most important organ 20lbs. or 16% total body weight heaviest organ skin, hair, nails, and specialized sweat and oil. Copyright (c) 2008, 2005 by Mosby, Inc., an affiliate of Elsevier Inc. All rights reserved. Slide 0 Copyright © Mosby Inc. All Rights Reserved. 1.4 Organ Systems of the Body. Unit 6 Human Physiology Systems Review. CALIFORNIA CONTENT STANDARDS: Physiology BI9. As a result of the coordinated structures and functions of organ.  Name an organ system and list as many organs as you can think of that are within that system.